What is the proofing process and why is it important? The art department at Label Tech is ready to proof your label to you! After you have submitted a PO and your art to your printer you should expect to see a proof. How that proof comes to you is completely up to you. 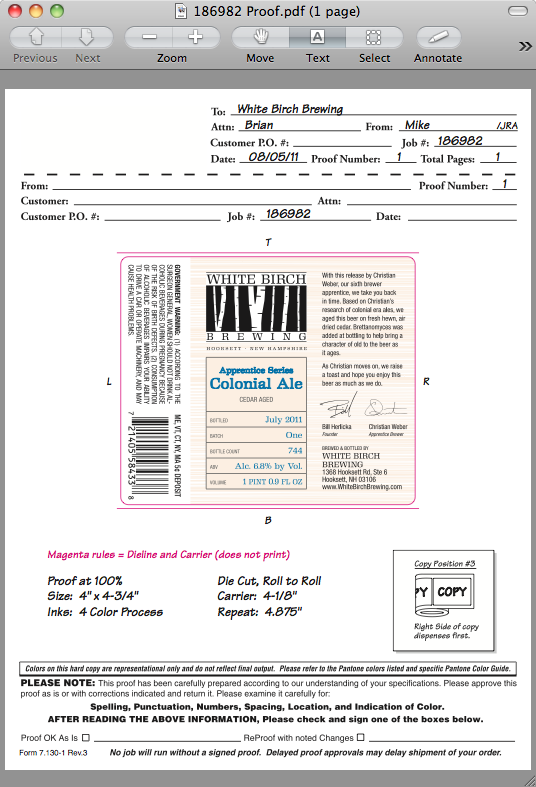 If your label is simple and just one color you may want to request a proof is emailed to you. If you are dealing with complex color schemes such as 4CP + 3 or 4 spot colors then you may want to have a hard copy proof sent directly to you. We can do both. The benefit to a hard copy proof is that our state of the art pre press department has an EFI print output that allows us to fingerprint our proofing system to our presses in production. The result is that your high output EFI proof looks exactly like your label will with the exception of reproducing spot colors. If you are looking for an emailed proof we can do that also!